Recognizing the connection between the zeros of polynomials when suitable factorizations are available and graphs of the functions are defined by polynomials. 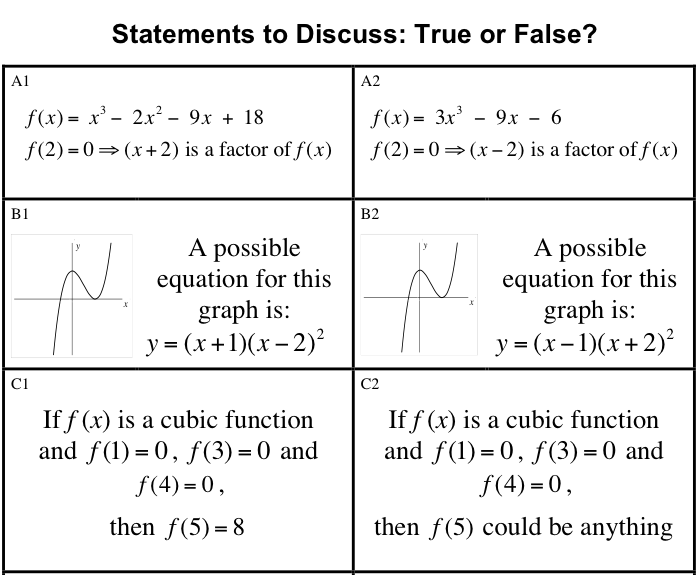 Recognizing the connection between transformations of the graphs and transformations of the functions obtained by replacing f(x) by f(x + k), f(x) + k, -f(x), f(-x)..
Before the lesson, students attempt the assessment task individually. You then review their work and formulate questions that will help them improve their solutions. During the lesson, students work collaboratively in pairs or threes, matching functions to their graphs and creating new examples. Throughout their work students justify and explain their decisions to peers. During a whole-class discussion, students explain their reasoning. Finally, students improve their solutions to the initial task and complete a second, similar task. Each student will need a mini-whiteboard, pen, and eraser, and a copy of Cubic Graphs and Their Equations and Cubic Graphs and Their Equations (revisited). Each small group of students will need cut-up cards Cubic Graphs, Cubic Functions and Statements to Discuss: True or False?, a large sheet of poster paper, and a glue stick. You may want to enlarge the cards and/or copy them onto transparencies to be used on an overhead projector to support the whole-class discussion. 20 minutes before the lesson, a 90-minute lesson (or two 50-minute lessons), and 20 minutes in a follow-up lesson. Timings are approximate and will depend on the needs of your students.